March 31st – A unique blockchain based gambling platform Zerocoin.bet is launching their Pre-ICO part 2. The presale event will last until April 27th, 2018 or until the hard cap is reached which is set at only 1500 ETH. During the presale, investors will be able to purchase ZERO tokens with a 58% bonus for a very limited time. ZERO token owners will be able to use it on the ZeroEdge.Bet platform to play 0% house edge games such as Blackjack, Video Poker and many others. ZERO tokens will also be used to place bets on the platform’s decentralized sports betting exchange which is expected to be launched in Q4,2018. Project’s development roadmap also includes a poker room and an open-source platform for building and operating your own customized games for which ZERO tokens will be required. One thing that really makes ZeroEdge.Bet stand out from other gambling-related ICO’s is their team which has a strong background in the gambling/gaming industries. To supplement the team and make ZeroEdge.Bet a huge success, the advisory board consists of numerous well-known & accomplished professionals with an extensive knowledge and experience in their respective fields. We can see why other blockchain-based gambling project haven’t really penetrated the market, so we want to come in well-prepared to be among the first to do this. We believe the experienced team and accomplished advisors are the key here. 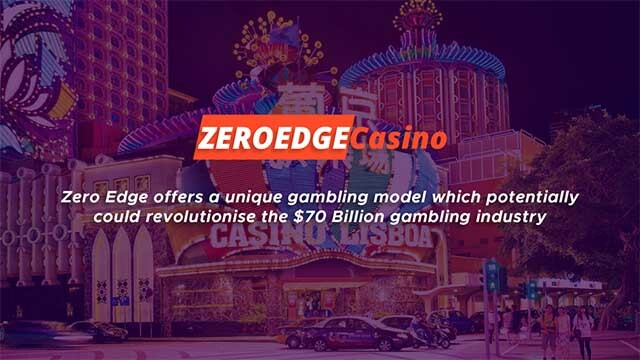 Zero Edge offers a unique gambling model which potentially could revolutionize the $70 Billion gambling industry. Players won’t be losing money but instead earning from the increasing Zerocoin value. Our ultimate goal is to become a leading gambling platform in the online gambling industry where thousands of different games are played each day using Zerocoin and where players have the best chance of winning. Zerocoin.bet is a unique concept set to revolutionize the way you gamble online. Currently, all online casino games come with a house edge, i.e. the advantage that the casino has over you, which varies between 1% to 10% or more, depending on the game. ZeroEdge’s solution – offer games with 0% house edge and give players a completely fair chance of winning. In other words, playing at ZeroEdge.Bet is literally free, you don’t have to pay anything to the casino like it’s with traditional online casino sites. We have made a survey & asked hundreds of people about their gambling preferences and experiences. The main finding was that 99% of them stated that they would choose 0% house edge games to play if such games were available. High demand for the world’s first 0% house edge games will increase the Zerocoin value exponentially. An important task for us will be to educate the players and raise their attention on this beneficial concept. Zerocoins (ZERO) will be available to investors during an upcoming ICO. Visit Zerocoin.bet.